Whenever I know that I’m going to travel anywhere, I ask people if there’s anything they would like me to try to find or pick up for them where I’m going. I mean anywhere I’m going and anything someone might like to have. Whether I’m headed to Safeway in Freeland on Whidbey Island or going to the Basilique du Sacré-Cœur in Paris, France, I’m ready and willing to try to find that little something you’ve been secretly hoping for but feel too bashful to ask. Most of the time, my keen hunting persistence pays off, and I’m able to bring back the desired trophy like a cat with a very annoyed, soggy mouse. I make my hunt-shopping offer for two reasons. Firstly, I fondly remember how wonderful it felt as a little girl when my father would return with a little gift for me from an exotic business trip (“Chicago” and “Sante Fe” sounded like very exotic places to me at the age of five), and in turn I now enjoy being able to surprise someone with an item they wouldn’t be able to find at home. Secondly, having an excuse to shop my way across continents contributes to a deeper exploration of my environment and the experience of novel (sometimes outrageous!) adventures that I wouldn’t have otherwise. Ultimately, hunt-shopping is a form of play for me. Perhaps considered a fool’s errand by some, hunt-shopping helps me engage the world and the people in it in ways that introduce me to what is foreign within a familiar context. Ostensibly, through the social exercise of shopping I’m looking for stuff. However, on a whole other level, I’m seeking adventure and knowledge about where I am. Also, my tastes (like my bank account) are modest, if somewhat oddly balanced between the ridiculous and the sublime. One request that particularly engaged my sense of exploration came from a friend of mine, Chris Lubinski, who seems to have arrived in this time from another era. Chris and her husband, Jerry, live on a wonderful wooded farm on Whidbey Island where they care for a large menagerie of animals including cairn terriers, mules, horses, and Shetland sheep. Their place is called Whoamule Farm, and you can find them here: http://www.whoamulefarm.com/. 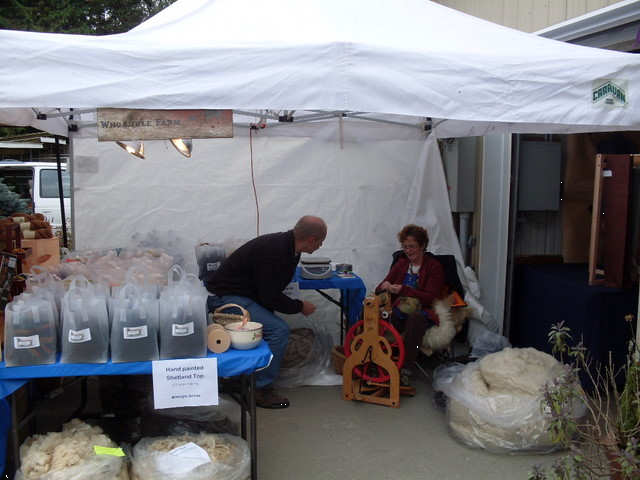 Chris is a fiber artist, working the wool of her sheep through all the stages of cleaning, carding, roving, dyeing and spinning. She asked me if I could bring back some “rovings” of Irish wool. Rovings are cleaned and carded wool that has yet to be spun. 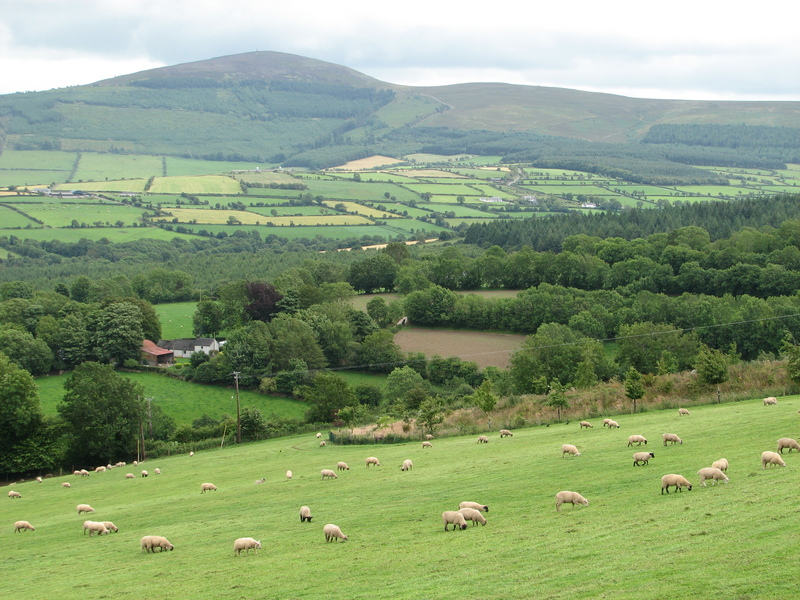 Chris had been trying for many years to locate a woolen mill in Ireland that would sell and ship un-spun wool, but she had not been able to locate a willing source. Actually quite charmed by her, I proceeded to compliment the fineness and interesting blends of the yarns in her shop. I chatted happily and sincerely about the wonderfulness of all things Irish. I bought a knit cap. Eventually, after 25 minutes, she owned as how the woolen mill on a side road of town might have what I was hunting for, though she still seemed to question the physical nature of “fluffy” wool and assured me that Irish sheep grow wool for a cold, dank climate – wool not at all “fluffy” but course and scratchy. I thanked her genuinely, pulling my new wool cap over my ears and headed out of the store and back into the cool misty rain of an Irish summer evening. The 17th century Kerry Woolen Mills is located about 8 miles west of Killarney in Country Kerry on the Ring of Kerry. The mill is one of the last surviving traditional mills still manufacturing in Kerry. Originally founded over 300 years ago to alleviate local poverty, the mill drew hydro power from the nearby River Gweestin in order to drive its machinery and provide the water necessary to wash and dye its wool. 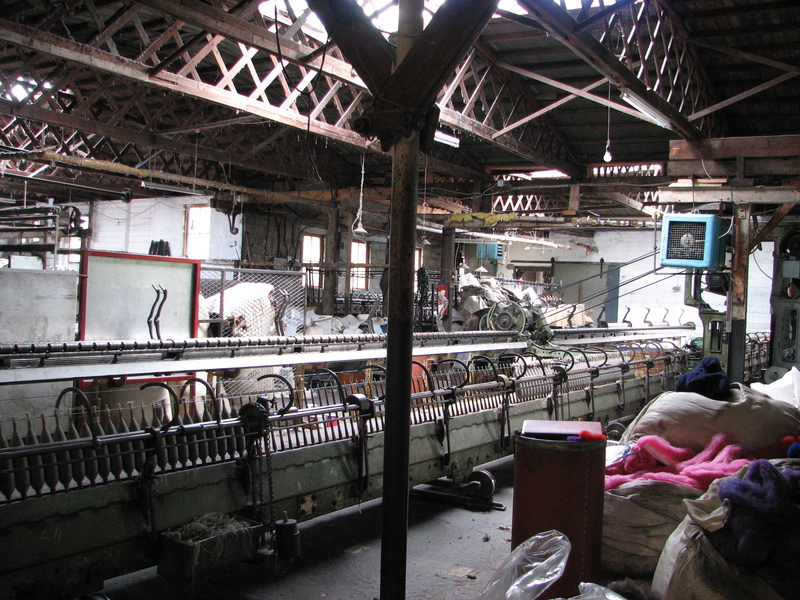 The mill was bought in 1904 by the Eadie family, who had previously been in the wool business in Fermangh and Scotland. The family is now in its fourth generation of ownership of the Kerry Woolen Mills, producing everything from scarves and sweaters to blankets and rugs. 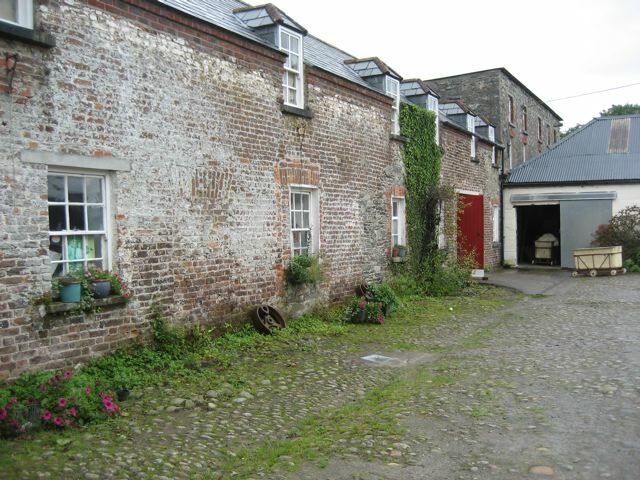 The old buildings of the mill were a treasure trove of wooly exploration to me. Entering first by way of the gift shop area, my senses were delighted by the textures and colors hanging and draped over every possible surface and shelf, burgeoning in the close quarters of long floor-to-ceiling wooden hall. After the few timid moments it took me to overcome my concern of being intrusive, I asked the clerk behind the large wooden counter if they sold wool rovings. Oh, boy, would I? Yes-sir-ee-bob! Like a service guide to the woolenly challenged, the cheerful clerk wove me through the back rooms connecting the gift-shop to the expansive mill area. I was in fuzzy heaven. 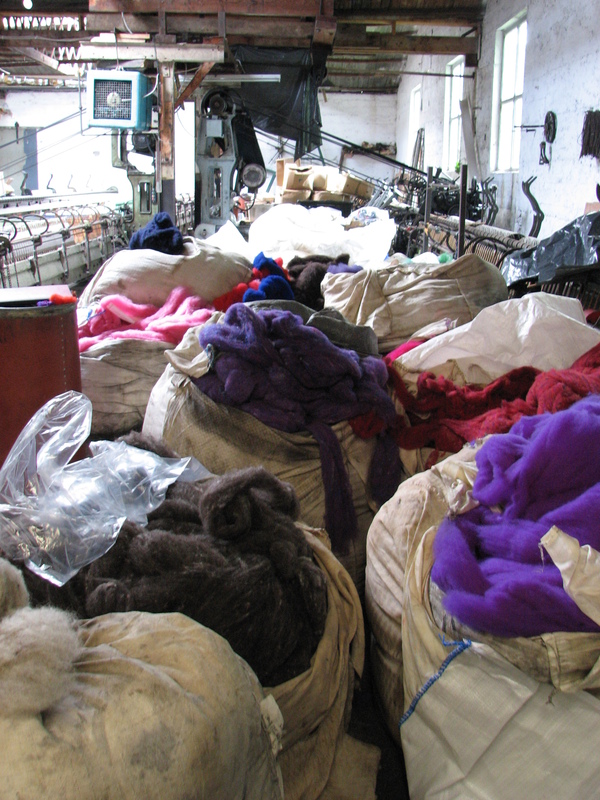 Cautioned by the clerk to be mindful of the moving parts of the machine loom currently in action across the full breadth of the warehouse, I was threaded at last to the eye of bliss – the massive collection of giant open bags of carded wool. Before me bloomed rounded pods of several natural (un-dyed wool) hues as well as jewel toned wool of bright oranges, reds, greens and blues. I filled two large, clear plastic bags with puffy rainbows of wool gauze – delighted with the successful outcome of my hunt-shopping expedition. I should also mention that I came across something quite wonderful that the Eadie family made on their magical cloth loom and shipped to me. You see, after stuffing my plastic bags with colorful wool, I returned to the gift shop area to discover one of the family owners of the mill working behind the counter. Our conversation revealed that he was an active lay Eucharistic minister in the Church of Ireland and that his mill had recently produced fine wool cloth in all the liturgical colors for new cathedral vestments ordered by the Roman Catholic Church of Ireland, who subsequently purchased the wool cloth in every color except white. “Would you like to see it?” asked the mill owner. 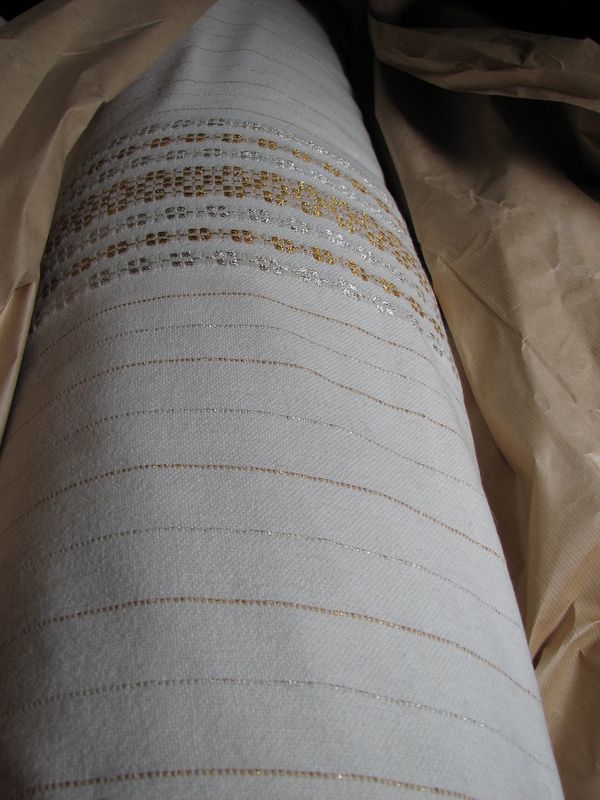 The white wool cloth was extraordinary, appealing to my sensibilities in every possible way – from its supple softness to its modest pattern of fine golden threads. I asked reverently if a liturgical stole could be made of it and sent to me across the pond. “Absolutely!” was the pleased answer. Someday, perhaps, I will be able to order a set of altar cloths and vestments in the same wool, but I am very happy to wear my soft, wooly stole and remember Ireland and the successful hunting trip in Kerry County. I found so much more than “stuff” there that I will keep in my heart, all the days of my life.